"I’ve always been attracted to double enders. Often perceived as the plain sisters of the shapely wherries, it pains me that they are so often overlooked by those searching for a really good time-tested boat. They are without a doubt one of the most sea kindly boats afloat as attested to by generations of Maine lobstermen. If you are looking for an excellent pulling boat, this is it. If you are looking for a traditional design that you can build on your own, this is also it. Most of all, however, if you would like to build an heirloom that will turn heads and serve your family faithfully for years to come, the Matinicus Double Ender definitely fills the bill. I have been meaning to write this book for a very long time. I put off it while gathering photos and further information, though my association with double enders actually predates my association with wherries. There has been a great deal written about the wherries, yet little has been written about our ubiquitous double enders. I aim to rectify that deficiency here and now." 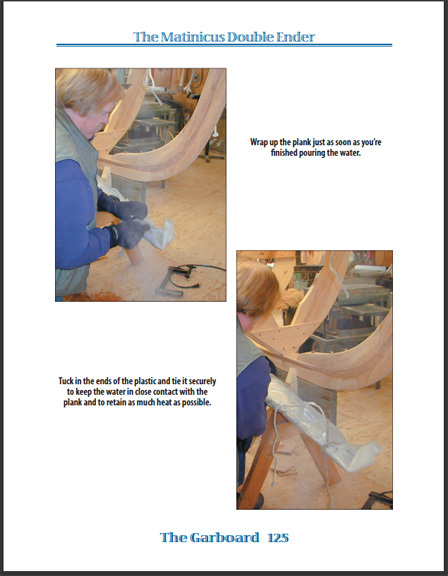 This book covers both the glued lapstrake plank-keeled version and Freedom II, a cedar planked vertical keeled pulling boat. 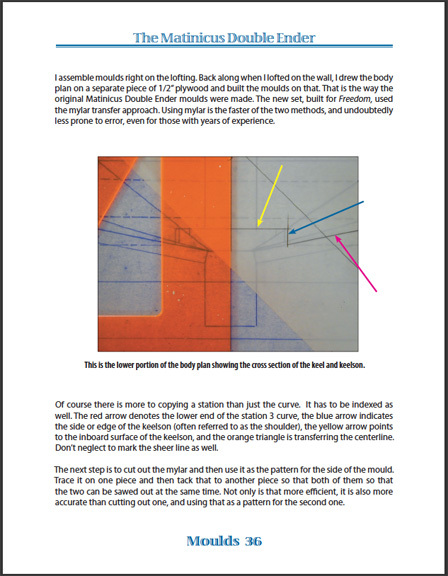 Straight from our shop to yours, here's a sample page from the section on lofting. And here's one of the pages that deals with steaming the garboard. Experience the entire process through 299 pages and 404 color photos. The Matinicus Double Ender is also in a black and white version as well as on CD. And, it's also available as a digital download so you can access it immediately and with no shipping charges.